Play and relax! Bowl a strike at the best resorts! A new game in a popular series awaits new winners! Bowl a strike at the best resorts! Two games at once – bowling and solitaire! 120 new levels await you – more than 8 hours of fun with your favorite game. Ten gold card-pins per level – discover a solitaire game with new rules! -Play, win and relax with your favorite game! 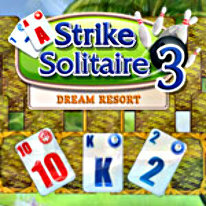 -Solitaire in the unique atmosphere of bowling resorts allows you to play two games at once – bowling and solitaire. -Another 120 new levels of varying difficulty for you to enjoy. -More than 8 hours of entertaining play await you, in which you'll dip into heady competitions at the best bowling resorts! -The presence of unique gold card-pins will add variety to the game mechanics you're used to.